SAN FRANCISCO (KGO) -- Just like two years ago as a wild card going to Pittsburgh, the San Francisco Giants will hit the road to begin what they believe can be another special, even-numbered-year postseason run. Even after the surprising second-half struggles and bullpen blunders that threatened their chances. The every-other-year Giants found their way back to the playoffs. San Francisco made it on the final day of the regular season, securing the second NL wild card with a 7-1 win over the Los Angeles Dodgers on Sunday to complete a three-game sweep of their rival. "We found a way to get back to where we need to be," ace left-hander Madison Bumgarner said. "If we play like we have been the last three days, we'll be tough to beat." 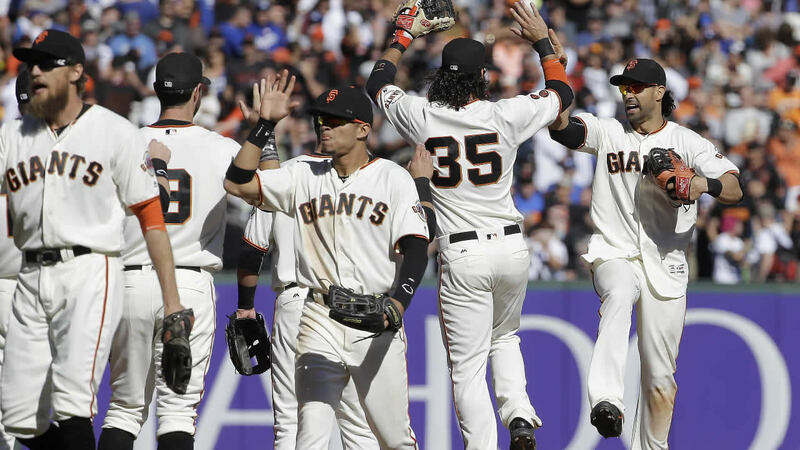 Denard Span hit a two-run triple among his three hits, and Buster Posey drove in three runs and had three hits as the club finished with its first four-game winning streak of the second half. San Francisco, which won World Series titles in 2010, '12 and '14, plays at the defending NL champion New York Mets on Wednesday night in the NL wild-card game, with the winner advancing to a Division Series against the Chicago Cubs. Bumgarner, the 2014 World Series MVP, will face Noah Syndergaard. "Everybody realizes this is do-or-die. This is playoff time for us already," first baseman Brandon Belt said. "We knew we needed to step our game up a little bit if we wanted to get in the postseason, and everybody did. ... I don't think it bothers anybody that we go on the road to win these games. It's actually a lot of fun. With Bumgarner on the mound, we're going to have a good shot." Los Angeles, the NL West champion, plays Washington in the Division Series. Dodgers broadcaster Vin Scully ended his 67-year career, calling his final game 80 years to the day after he fell in love with baseball while walking home from school. Midseason acquisition Matt Moore (6-5) allowed one run and three hits in eight innings as San Francisco (87-75) reached the playoffs for the fourth time in seven seasons. The Giants began the day one game ahead of St. Louis. The Dodgers got a scare when center fielder Joc Pederson came up slowly after diving and landing on his right shoulder trying for Brandon Crawford's RBI single in the eighth. San Francisco's fate came down to Game No. 162, just as it did in 2010. That year, Jonathan Sanchez pitched the Giants past San Diego for the division title. San Francisco went on to win the franchise's first World Series since moving West in 1958. The Giants led the majors with a 57-33 record at the All-Star break. After an up-and-down second half and a series of bullpen meltdowns since the break, San Francisco delivered an impressive offensive performance against Kenta Maeda (16-11), who surrendered five runs and nine hits in 2 2/3 innings. "This is what makes this as special as what's happened in the past," manager Bruce Bochy said. "We had two different halves. If we wouldn't have gotten to the postseason, this would have been really hard to take, sitting in our position at the All-Star break." San Francisco has won 16 of its last 20 home meetings against the Dodgers. Third baseman Conor Gillaspie went over a railing and TV camera and into the photo well to snag Chase Utley's foul popup to begin the third. "A superior catch, tumbling over the railing," declared 88-year-old Scully. "Gillaspie refused to quit, eyes riveted on the ball ... all's well that ends well. The Giants are pumped."